One evening, while at a residential conference on education on the east coast of Australia, again in Gumbaynggirr country, I retired late. Tired as I was, I was more restless than sleepy. The crashing of waves on the shore just metres from where we were cabined, seemed to be calling me. Not being one to take myself off in the dead of night, alone, I decided that I would venture to the beach at first light. As the first light of dawn became visible I walked to the beach. I continued to walk up the beach. I was contemplating the sleepless night, the sense of being called and the uneventful morning when I hear the old man cry out ‘It leapt!’ … I had missed it! The old man left the beach very joyful … and I felt happy for him. I then focused on a space in the clouds, which I suspected would allow the sun to shine through. As the sun hit the sea, in the very spot it did this, there it was! The tail of the whale shining in all its glory! This glow, this shape, this light filled connection, truly ‘lit me up’. It moved me to a vibrantly alive place. 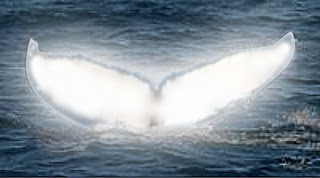 This image, since I do not have a photo of what I saw, gives a sense of the glowing tail of a Humpback Whale, reflecting the sunlight. My experience was one where to me, the glow emanated out from the tail as if the droplets of water that were swung outwards from the tail itself, picked up the light. The shape was only defined in light. In a dark sea and sky this shape shone ever so brightly. It illumined the sea and me. This experience put a smile on my face that did not leave for days. It took me so ‘out of my head’ that I really was not taking in a lot of education business. I felt transported to another place of perceiving the world around me. I was able to see how we in education at this conference were all so busy trying hard to get it right. What I had experienced was so far beyond what we could experience with our ‘teaching’. This was not the first time, but it was a powerful time for me to see ‘learning’ differently. This was the first of my whale experiences. There are others. All have heightened my awareness of life, feeling and learning in a myriad of ways. Several of these have been at Valla Beach, where just last month, as relationships with time and place would have it, a baby Southern Right Whale was born. Within a few years of the whale ‘lighting up my life’, the First International Dolphin and Whale Conference was held at this very place. It was also where an Elder and a circle of men of this country sat and welcomed the people who travelled from all parts of the world. It is where scientists, environmentalists and mystics also listened and learnt from these ‘First People’. What was shared at this and subsequent conferences, between people of different places and ways of thinking and knowing, was in a sense a huge relationship building exercise, a building of relationships between people, places and stories. So in a sense this experience holds within it, my entrance into a world of knowing. I am still on the threshold of this ‘knowing’ of the part the whales play in this awesome interplay of life on this planet. I am not about to express what that all means, nor can I. Instead I will quote an Indigenous Elder of today who speaks of ‘a way’ that is held by the First People.